Square Inc. (NYSE: SQ) stock is down 6.5% since its first-day close of $13.07 on Nov. 19. And our Square stock price prediction sees SQ falling lower in 2016. Square is a financial tech startup founded in 2009 by Jack Dorsey and Jim McKelvey. The company provides a mobile payment service for phones and tablets. Its primary product is the Square Reader software, which plugs into a standard headset jack and lets users accept credit and debit card payments. Each Reader costs about $10. Many investors thought the Square stock price would see long-term gains after its highly anticipated debut. Despite popping 45.2% on its first day, the Square IPO failed to meet expectations as it priced below the $11 to $13 range at $9 a share. The company only raised $243 million and was valued at $2.9 billion – less than half of its private valuation a year earlier. The Square stock price quickly fell in the wake of the lackluster IPO. It peaked at $13.83 on its second day of trading before falling 9% during the week leading up to Thanksgiving. Yesterday (Tuesday, Dec. 22), shares were down 0.12% and trading at $12.27 a share. 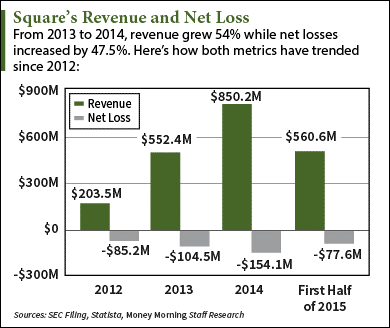 The first reason why the Square stock price will fall in 2016 is simple – the company is far from profitable. During the first six months of 2015, Square raked in $560.6 million in revenue – a 51% increase over the same period in 2014. Despite big revenue growth in 2014, the company incurred $850.2 million in losses. About 11% of this year's sales came from its partnership with Starbucks Corp. (Nasdaq: SBUX), which started selling Square Readers at all U.S. locations in 2013. However, Square has actually lost $71 million from the partnership. The company is already in a $77.6 million hole this year and openly said in its IPO filing that it may never turn a profit. 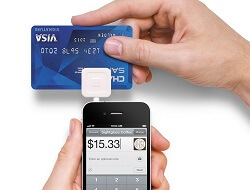 I believe Square has enormous potential over the long run simply because it is a savior to small business. It has saved our little Co. because it brings a Company closer to its clients through instant communication. The most valuable service they render to small business is instant credit . They make Capital available without red tape to small business based on customer's comments and deposit history. Square transformed our Business and we are grateful for what they have done for us and for what they are doing for thousands of others who like us cannot subscribe to the archaic Loan process of mainline Banks.